This city of Paynesville park is just off Old Lake Road and features a swimming beach with lifeguards, a playground, changing rooms, picnic tables and grills, sand volleyball courts, parking, and a nearby public access. 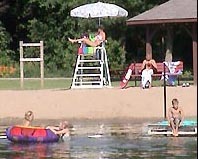 The Regional Park on the south side of Lake Koronis features a playground, beach, sheltered picnic area with kitchen, camping, meeting facilities and more. The beginning of a nature trail at the Regional Park. A lookout tower, picnic shelter and boat ramp are also located inside the park. The trail will run along farms and cropland as it circles Lake Koronis. Cattails in bogs can be seen in various places along the proposed trail. Lake Koronis has many different kinds of habitat for fish. The outlet dam on the southeast end of Lake Koronis controlls the level of the lake and features a carp trap. Carp caught in the trap are discarded or sold, but game fish are returned to the lake. There are five public accesses around Lake Koronis for launching fishing or speed boats. The Dakota Indians came up the rivers from the south to fish and gather berries during the summer months. 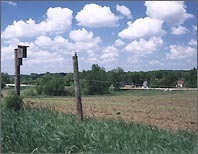 This burial mound can be found near the outlet of Koronis. From State Highway 55, one can see Kruger Pond and across Old Lake Road Lake Koronis. Kruger Pond is a haven for aquatic vegetation plus birds and animal life. All along the road around Lake Koronis, there are many different sights, sounds and smells. The Lake Koronis Recreational Trail will go past many of them as it weaves it way around the beautiful Lake Koronis. Another beautiful view of the lake.